Ro Lockett thought the woman who complimented his children while in Finish Line and then wound up behind him at a T-Mobile store in Frisco's Stonebriar Centre was trying to hit on him. He quickly discovered that the woman — a Finish Line employee — was scoping him out for a different reason earlier this week: She thought he was a thief. A Frisco police officer was waiting to handcuff Lockett and a friend when they left another sporting goods store. "I'm just a dad out with his kids, buying things for them from several stores," said Lockett, 28. "And all of a sudden I'm in handcuffs." Lockett, who is black, and his friend, Brandon Kibart, who is white, were suspected of shoplifting about $600 worth of items from Finish Line on Wednesday, according to a Frisco police report. 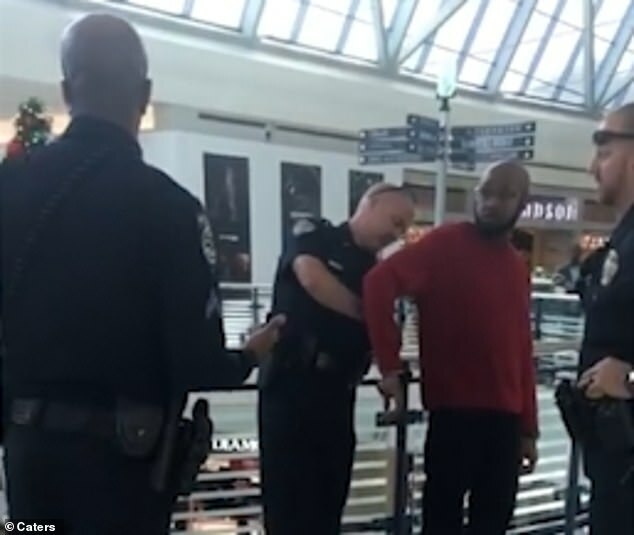 They were handcuffed for several minutes while a store employee rifled through bags filled with purchases from multiple stores — but nothing from Finish Line and nothing that they hadn't paid for. The two men were released after producing receipts for all the items in their bags. "This is how it happens in America, people," Lockett can be heard saying in a recording of the incident posted to his YouTube channel, CreedCrudeTV. One of his children shot the video. Another of Lockett's kids looks on curiously in the video as the father and Kibart stand handcuffed near an area where children were waiting to speak to Santa Claus. "Thank GOD, I remembered 'the talk' I was taught as a child: that being Black, I'm presumed guilty until proven innocent in America ... something I never understood or felt applied to me until this," Lockett wrote on YouTube. The video lasts 7 minutes and 40 seconds and features casual talk between the officers and the two men while the employee examines the contents of the shopping bags. "We had just walked out of Champs, and a Frisco police officer told us to drop our bags," said Kipart, a Plano resident who owns a construction and remodeling company. "There was no resistance. We just did as we were told." Frisco police on Saturday said the incident was being reviewed. "The Frisco Police Department is aware of the video circulating online and the questions that have been raised," the department said in a prepared statement. "Through our long-standing contacts with local community leaders, we have been in contact with one of the involved parties, Mr. Lockett, and have attempted to contact the other, Mr. Kibart. Mr. Lockett was given information on how to file a formal complaint and we encourage both parties to do so. "This incident highlights the importance of 'comply now, complain later,'" the statement read. "By all accounts it appears that this is what Mr. Lockett and Mr. Kibart have done, which gives us the opportunity to evaluate our response to determine what happened and if there is opportunity for improvement." A spokeswoman for Stonebriar Centre referred questions to a Finish Line representative, who did not reply to questions sent via email Saturday evening. The Collin County chapter of the NAACP, in a prepared statement, said it had spoken with Lockett and Kibart, as well as representatives from Frisco police. "We have attempted to reach officials from the Finish Line, as we are concerned that this is another case of 'existing while black,'" the statement read.The NAACP will continue to monitor the situation, the statement read, and "move forward based on the information that we receive." The attorney for Lockett and Kipart, Haben Tewelde of the Dallas-based Tailim Song law firm, wondered why a Finish Line employee was allowed to go through the shopping bags instead of police. "I think when you have instances like this, it's usually framed as a black issue, but it's growing into a bigger issue and not just a black issue," Tewelde said. "These are instances when more and more people are being deprived of their Fourth Amendment rights" against illegal search and seizure. Frisco police said in its statement that shoplifters often place stolen property from one store in a bag from another store. "Since the employee thought a theft had occurred," the statement said, "they would have been attempting to recover their merchandise under Texas Code of Criminal Procedure." Tewelde didn't rule out taking legal action, but for now his clients want to start a conversation. "First and foremost, we want to work with Stonebriar to get to the bottom of this," Tewelde said. "Our clients would just like to see that it never happens again." Lockett, a YouTube content creator who lives in Dallas, said he talked to his children after the incident. "I told them that everything that was done and how it was handled was wrong," he said. "My kids are scarred for life. Their dad is [handcuffed] in front of his kids just for buying things for them?"